l have always loved handmade furniture. 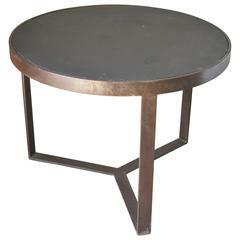 This is my little side table that we had made out of steel and gilt overlay. We find old marble and have it inset as the top. It's a very heavy solid table not easy to pick up alone. 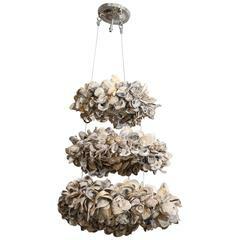 I wanted very well made products with a vintage look but modern approach. Custom sizing available. Even though this is brand new it is make to look vintage or not perfect and we use old marble when we can. 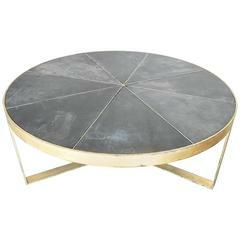 1940s Spanish gilt iron coffee table with grey marble top. The stone photographed on this table base has scratches and repairs made but has been polished. 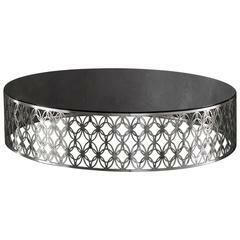 Unique steel base and marble-top coffee table. Table has a solid walnut trim. Marble in great condition. Marble is attached. 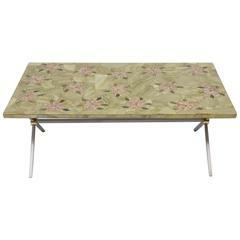 1960s Italian coffee table with brushed steel and polished brass base has beautifully executed marble mosaic top in pink and white flowers on a green background. Haute Bohemian! French gilt iron coffee table with marble top. 1970s modern Italian brushed steel base with marble top coffee table. The table is well made and very heavy.